(Note to pedants: yes, this post is tagged, “Insects” and spiders are arachnids, but they’re all arthropods and I don’t feel like changing my category tags)This news bit in the morning paper caught my eye: a family was saved from a house fire because they noticed the spiders were on the move. One daughter was relieved of her arachnophobia from this.See? Spiders are our friends! True, they are venomous, but only a few species actually have the capacity to harm humans. The rest are doing their best to keep insects from taking over the world.I take that back — the insects are not trying to take over the world. It’s always been theirs. We’re out-numbered and always will be. So, get to know your neighbors! While I was mowing, there appeared to be a crumb of perlite running through the grass. 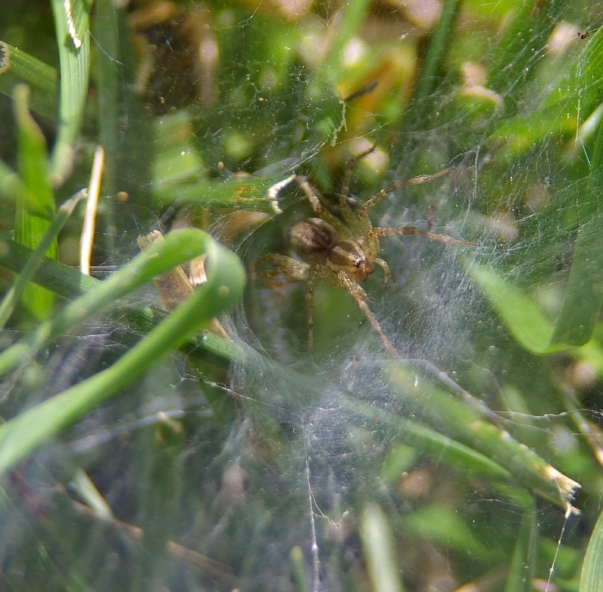 It was instead another grass spider, carrying her wee ‘uns off to safety. 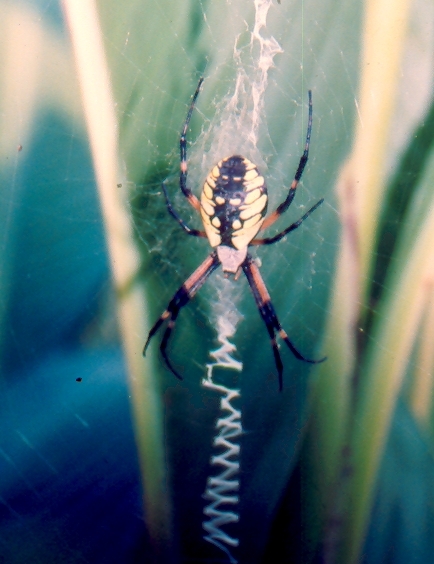 Our daughter named this garden spider (Argiope) Miss Boots, due to her leg colouration. Miss Boots got bigger and bigger and … well, you know how the story goes. She became Mom Boots, and after producing this, I thought she looked quite exhausted. I don’t think I was anthropomorphising too much; she died a day later. 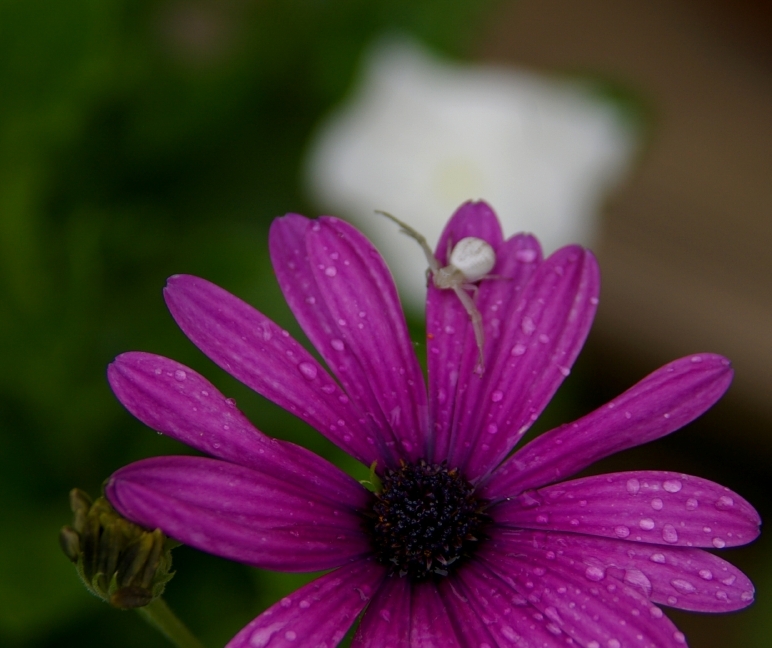 Sometimes I see crab spiders (Thomisidae) hanging around on my flowers. 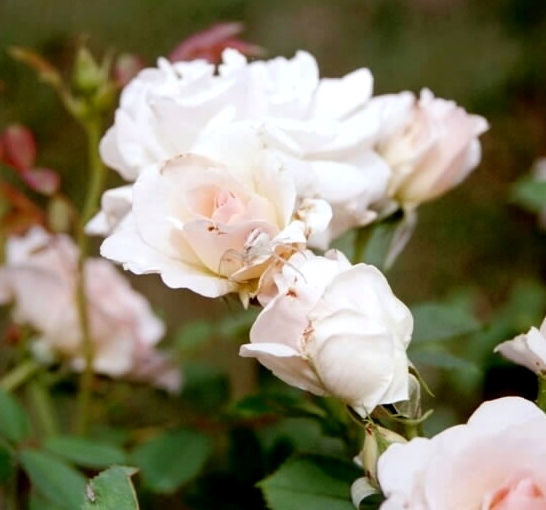 The smart ones side on pale flowers, like the ‘Morden Blush’ rose. 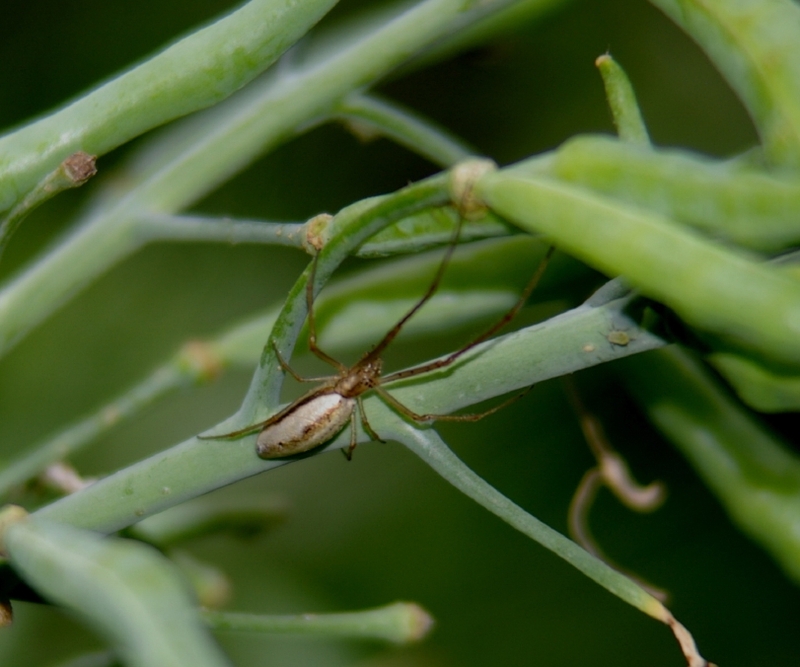 The long-jawed orb weavers (Tetragnathidae) usually hang around my pond, but this one was in the veg garden. Given the numbers of dragonflies, water striders, goldfish and toads, it may have felt out-classed by the other predators. 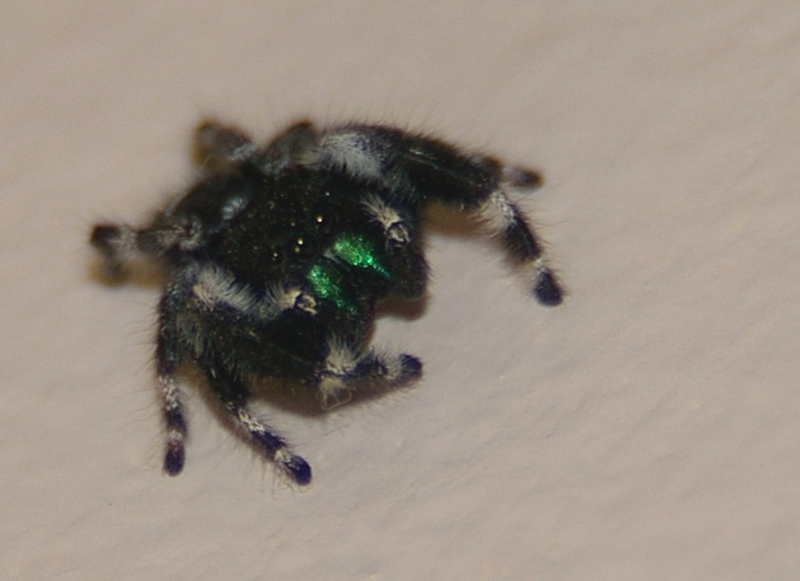 And the moment you’ve been waiting for, the Green Man, Jumping Spider! Courtesy of a bedroom visitor (Salticidae) clambering around on some desk décor. Here’s a close-up showing off some beautiful chelicerae (fangs). 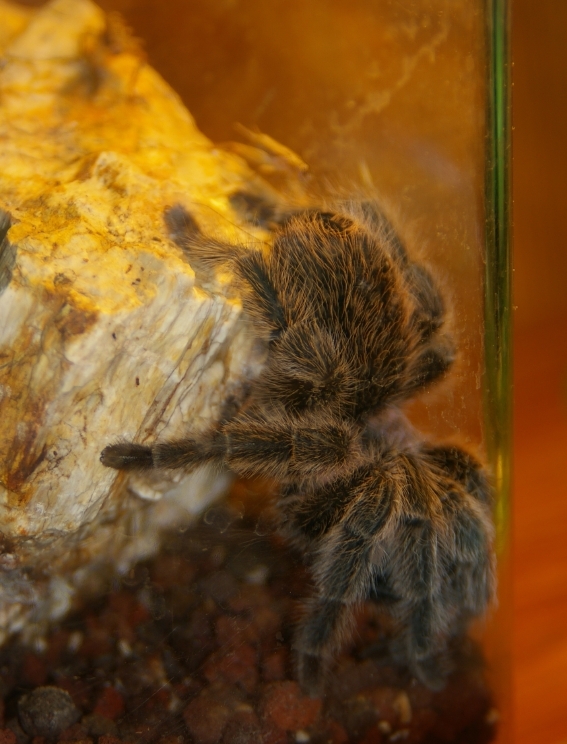 Another desk resident is my tarantula, Rosie (Grammostola cala). No, she’s not stuck, she’s just contemplating the massive earth-moving job that she was about to undertake for her annual habitat-renovation. BEE OR NOT A BEE? This is the answer page to a quiz that starts on this page. Number 1: Not a bee. This furry gold and black insect with the very long proboscis is a moth, the snowberry clearwing (Lepidoptera: Sphingidae Hemaris diffinis). Number 2: Not a bee. This gold and black insect with one pair of wings and tiny bristle antennae is a fly called the bee fly because well, it looks like a bee (Diptera: Bombyliidae Villa lateralis). Number 3: Not a honeybee, but definitely a kind of wasp. This is the cicada-killer (Hymenoptera: Crabonidae Sphecius speciosus), a big ol’ thang about 25 mm long, and only dangerous if you’re one of those cicadas it’s taking home to feed to the kids. 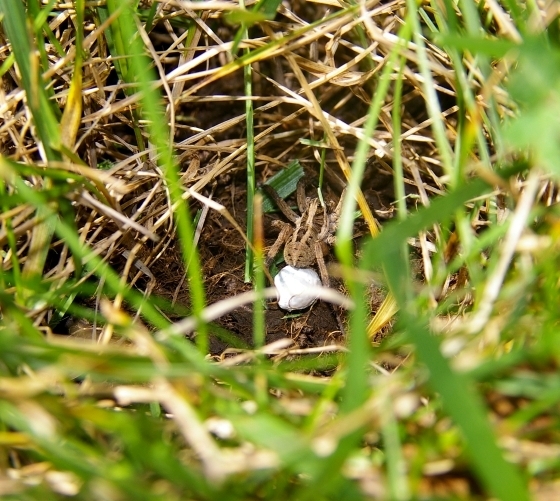 Cicada killers build nests in the soil, and the buzz when they’re coming out of the hole can be alarming, but they’re actually rather laid-back. Don’t freak out if you see one. Number 4: Not a bee. This is another silly fly pretending to be a bee (note just one pair of wings, teensy antennae). Their larvae are predators of aphids and other pests, and the adults are minor polinators, so they’re “good guys”. Number 5: Bumblebee (Hymenoptera: Apinae Bombus pennsylvanicus). Furry gold and black, buzzes, two pairs of wings, bee-type antennae and mouthparts, check. You’ll see bumblebees out in the early morning before the honeybees because they can stand cooler temperatures. Although big and noisy, bumblebees are also rather laid-back; out in the garden, we work around each other all the time. Have fun with these? Remember, not everything black and yellow that goes “buzz” is a bee! Hummingbird moth (Lepidoptera: Sphingidae Hyles lineata), a kind of sphinx moth, also known as the white-lined sphinx moth (not surprisingly). Yes, I did. And, thank you! Andrea, Are these all photos you’ve taken? They are just stunning! Suzanne, this is a fine place to comment, no problem. I just added a picture of what’s usually referred to as the hummingbird moth, which is a different species in the same family as the snowberry clearwing. This as you can see, is the problem with common names — they’re nonspecific! Several things will be called by the same common name (like these two moths), and the same thing can have several common names. I’m confused about where to comment. I decided here. We have had the clearwings (also called hummingbird moth. wild creatures!) here. I have coveted my neighbor’s baptisia (false indigo) as seen in number 5. What I REALLY want to know is, does the Japanese Beetle have any redeeming qualities? 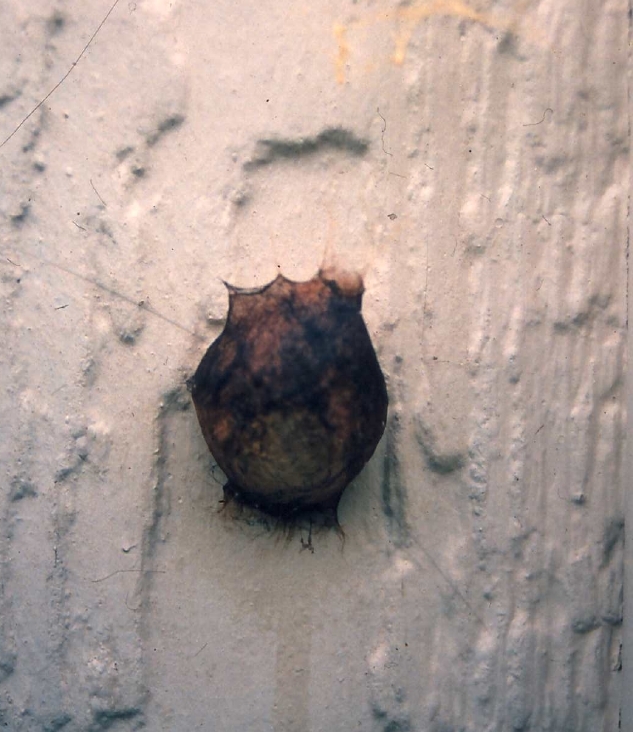 They eat our trees and plants, and poop all over the deck and in our kids’ pool. Then they hang out, casually mating. grrr.